I’ve used math videos from each of these Youtube channels and I love them. They’re high quality and engaging for the kiddos. I’ve included a math video from each channel to help you get a feel for what they offer. You can also click on their header image below to head to each channel. Some of them offer instructional videos in other subjects as well. You *might* be living under a rock if you’ve never heard of Khan Academy and their website. Basically, they have videos for teaching everything math, and have expanded to languages, the sciences, and more. They’ve changed their website to now allow more direct student interaction and paid services. Their YouTube page is a bit easier to find a simple video to use as a lesson, in my opinion, versus their website at this point. The videos are simple and straightforward and teach math concepts well. PBS Math Club is new to me but I was quite impressed with the videos. With the older kids on their image, I expected the videos to be only targeted to upper grades, but I was pleasantly surprised to see a few I could use in 3rd grade as well. The videos do a great job using real, relevant topics to teach math concepts to students. I also love their 15 second snippets that teach easier concepts. Have Fun Teaching is website and YouTube channel with a ton of free teaching resources. A lot of their videos are geared toward the primary grades but they do also have them for the intermediate grades as well. I used this video when we were working on geometry to help introduce my students to different polygons and the roots that will help them understand different mathematical terms that have them. Shmoop offers videos on a variety of topics. With their quirky style, the kids are engaged and attentive to their message. These are especially good for upper elementary grade students. The Teacher Tipster is pretty popular- with good reason. His practical tips and strategies that he uses every day in his classroom are real and work. I love his style and never get bored with his videos. Math Antics videos cover so many topics and strands of math. 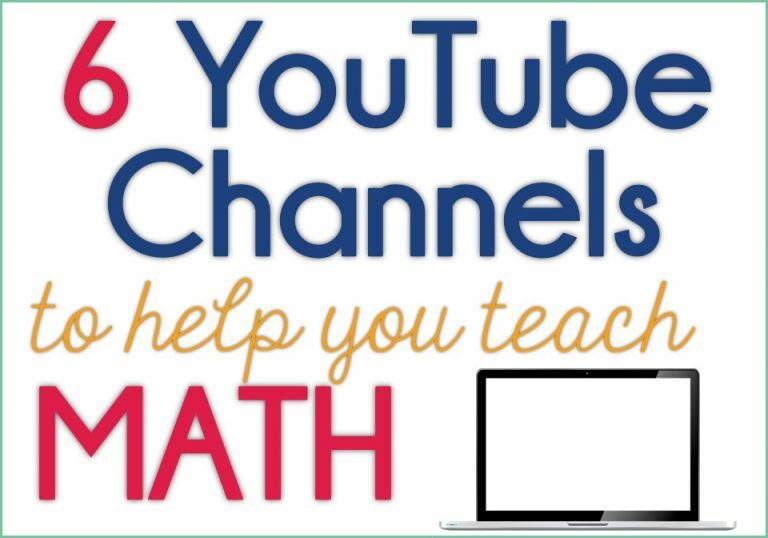 I always know I can count on this channel when I’m looking for a math video to teach a concept. While the videos aren’t as showy and fun as some other channels, they do a good job of teaching the math concepts. While, I don’t share math videos, I also have a YouTube channel where I share tech tips. You can follow that here. Do you have a favorite YouTube channel that you use for math instruction? I also have a collection of YouTube Channels to help you teach science! Head over to that post by clicking the image below. This is a great list, I found a couple new ones to use! I love to have links on my website of what we're learning in math for parents and students to reference at home. I also use the ShowMe App to make videos myself and the kiddos make them in class on ipads sometimes. The math channel my students love is NUMBEROCK. Hi! We just shared this post on our pinterest page – awesome links. Can you check out our videos, and consider adding them to a list like this in the future? I hope you don’t mind if I shamelessly plug my own YouTube channel. I started making videos to help my students review and I share the links with parents so that they can watch as well. You forgot Mathbyfives. He does higher level and lower level math. Simply great…ideal for both the slow and fast learners, and the teachers as well. Many thanks, Tessa.